What is new in ‘Nero Start’? Starting with Nero 2019 generation, ‘Nero Start’ (to some also known as Nero Launcher) comes in a refreshed design and updated workflows. Now, you will get going with your Nero product much more easily and achieve result faster than before. The new user interface with completely updated design and workflows now includes animated buttons, which make the former next/previous page behavior superfluous. This way, you can directly open the info and video tutorial windows per application, now. Moreover, it integrates a last used application function and gives prominent access to new Nero KnowHow PLUS. Via a slider, Nero Start allows you to change the UI between a lighter and a darker UI version. Another highlight is ‘1-Click Video Story‘, that integrates into ‘Nero QuickStart’. Simply drag & drop photos or videos to the drop zone and your files will load automatically with a predesigned movie theme inside of Nero Video. Also see Nero KnowHow 00139. ‘Nero Start’ is available for all Nero Suite and standalone products, and also includes access to new ‘Nero KnowHow PLUS’. First published with Nero 2019, ‘Nero Start’ becomes independent of the installed Nero Suite generation. 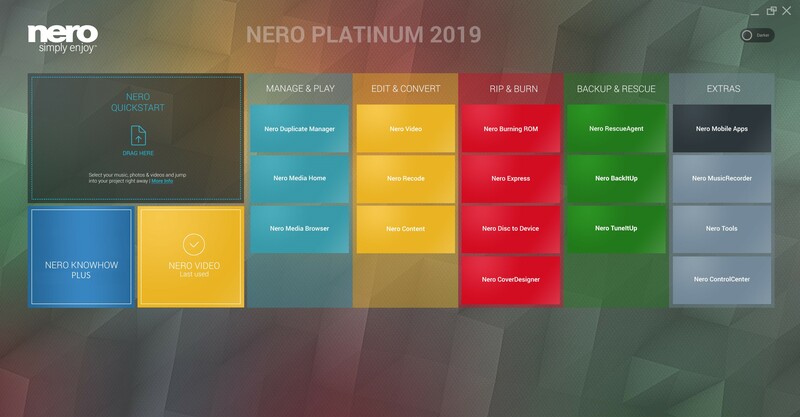 It is part of the Nero product installer but installs individually as ’Nero Core’ (including Nero Start, Nero Control Center, Nero KnowHow PLUS, and Nero Update), after which the Suite applications will be installed. From Nero 2019, ‘Nero Start’ will reside on the system and integrate with the Nero product version you own. Your product version displays prominently in the header of Nero Start. Even if you uninstall Nero Suite, ‘Nero Start’ with ‘NeroKnowHow PLUS’ and ‘Nero ControlCenter’ will still be available and usable. Because ‘Nero Start’ will be generation independent, you will no longer see a version number associated to the Nero icon in Windows Start Menu. The icon will not say ‘Nero 2019’, but will just say ‘Nero’, or ‘Nero Start’ respectively. If a desktop shortcut was not added automatically, clicking on this icon in Windows Start Menu, will launch the application and automatically create a desktop shortcut for ’Nero Start’. In some circumstances, it can happen that after the initial installation of Windows prerequisites and ‘Nero Core’, the installer will ask you to reboot. In most cases, the installation for Nero applications will automatically continue after the reboot. In the rare case that the installation does not continue automatically, please run the installer you received with your Nero ESD purchase or run the Nero program installer on the DVD of your Nero retail product again, to finalize the installation. Previous Previous post: Does ‘Nero Recode’ support latest device profiles? Next Next post: What is ‘Nero KnowHow PLUS’?